Lazarou, Chrystalleni and Matalas, Antonia-Leda 2010. 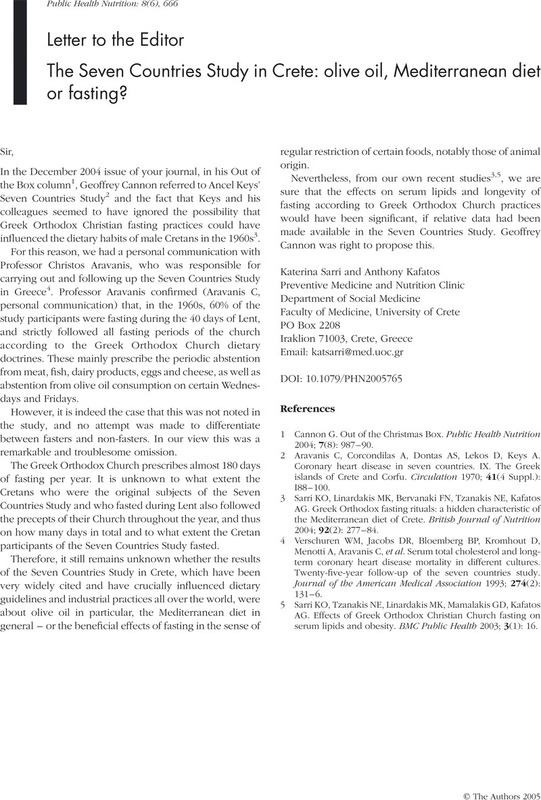 A critical review of current evidence, perspectives and research implications of diet-related traditions of the Eastern Christian Orthodox Church on dietary intakes and health consequences. International Journal of Food Sciences and Nutrition, Vol. 61, Issue. 7, p. 739. Sarri, Katerina Linardakis, Manolis Codrington, Caroline and Kafatos, Anthony 2007. Does the periodic vegetarianism of Greek Orthodox Christians benefit blood pressure?. Preventive Medicine, Vol. 44, Issue. 4, p. 341. The Seven Countries Study in Crete: olive oil, Mediterranean diet or fasting? 1Cannon, G. Out of the Christmas Box. Public Health Nutrition 2004; 7(8): 987–90. 2Aravanis, C, Corcondilas, A, Dontas, AS, Lekos, D, Keys, A. Coronary heart disease in seven countries. 9. The Greek islands of Crete and Corfu. Circulation 1970; 41(4 Suppl. ): I88–100. 3Sarri, KO, Linardakis, MK, Bervanaki, FN, Tzanakis, NE, Kafatos, AG. Greek Orthodox fasting rituals: a hidden characteristic of the Mediterranean diet of Crete. British Journal of Nutrition 2004; 92(2): 277–84. 4Verschuren, WM, Jacobs, DR, Bloemberg, BP, Kromhout, D, Menotti, A, Aravanis, C. Serum total cholesterol and long-term coronary heart disease mortality in different cultures. Twenty-five-year follow-up of the seven countries study. Journal of the American Medical Association 1993; 274(2): 131–6. 5Sarri, KO, Tzanakis, NE, Linardakis, MK, Mamalakis, GD, Kafatos, AG. Effects of Greek Orthodox Christian Church fasting on serum lipids and obesity. BMC Public Health 2003; 3(1): 16.